Objectives To examine with a parallel group study design the performance and physiological responses to a 14-day off-season ‘live high-train low in the heat’ training camp in elite football players. Methods Seventeen professional Australian Rules Football players participated in outdoor football-specific skills (32±1°C, 11.5 h) and indoor strength (23±1°C, 9.3 h) sessions and slept (12 nights) and cycled indoors (4.3 h) in either normal air (NORM, n=8) or normobaric hypoxia (14±1 h/day, FiO2 15.2–14.3%, corresponding to a simulated altitude of 2500–3000 m, hypoxic (HYP), n=9). They completed the Yo-Yo Intermittent Recovery level 2 (Yo-YoIR2) in temperate conditions (23±1°C, normal air) precamp (Pre) and postcamp (Post). Plasma volume (PV) and haemoglobin mass (Hbmass) were measured at similar times and 4 weeks postcamp (4WPost). Sweat sodium concentration ((Na+)sweat) was measured Pre and Post during a heat-response test (44°C). Results Both groups showed very large improvements in Yo-YoIR2 at Post (+44%; 90% CL 38, 50), with no between-group differences in the changes (−1%; −9, 9). Postcamp, large changes in PV (+5.6%; −1.8, 5.6) and (Na+)sweat (−29%; −37, −19) were observed in both groups, while Hbmass only moderately increased in HYP (+2.6%; 0.5, 4.5). At 4WPost, there was a likely slightly greater increase in Hbmass (+4.6%; 0.0, 9.3) and PV (+6%; −5, 18, unclear) in HYP than in NORM. Conclusions The combination of heat and hypoxic exposure during sleep/training might offer a promising ‘conditioning cocktail’ in team sports. In team sports, relatively short periods (ie, 1−2 weeks) of hypoxic or heat exposure/training may provide effective acclimation strategies prior to competition3 ,6 ,10 ,12 or during training camps to acutely improve fitness.6–8 Hypoxic exposure (eg, sleeping) can result in an increase in red blood cell volume or haemoglobin mass (Hbmass)6 ,13 and improved exercise economy or buffering capacity; physical training under hypoxic conditions has been reported to promote adaptations at the muscle level.6 ,14 In contrast, heat acclimatisation generally increases PV.15 ,16 Thus, theoretically, it is possible that combining both stimuli (ie, hypoxic exposure and training in the heat) would provide an additional training stress and afford a substantial improvement in total blood volume and convective O2 delivery17 and, in turn, high-intensity exercise performance. However, the potential physiological and performance responses to a combination of hypoxic and heat exposure have not been investigated. It is therefore still unknown whether combining hypoxic and heat exposure will have an additive effect on physical performance. Nevertheless, with the exception of one study,18 short-term (ie, ≤2 weeks) exposure to hypoxia as implemented in team sports19 has not been demonstrated to be sufficient to stimulate erythropoiesis.6 ,13 While these observations may raise questions over the efficacy of the short-term hypoxic training camps in endurance athletes, recent findings still suggest a possible beneficial effect in team sports athletes, under specific environmental conditions.19 For instance, the Hbmass responses to hypoxic exposure being inversely related to athletes’ baseline Hbmass,20 ,21 which is likely lower in team sport players than in endurance athletes, a possibly greater (and hence, substantial) increase in Hbmass could be observed in this specific population. It has also been suggested that the short hypoxic exposure time, which is common to team sport camps, could be compensated by an increased level of hypoxia (ie, simulated ≥3000 m,22 which may provide increased haematological responses). Finally, since the heat-acclimatisation effects on performance in team sport players may occur within a week,7 an ergogenic benefit may be likely, regardless of the possible hypoxic-related responses. The aim of the present study was therefore to describe the haematological and performance adaptations to the combination of heat and hypoxic exposure in elite AF players over a 2-week training camp (ie, live high-train high and low in the heat, interspersed model) and their changes during the following month. It was expected that heat training would lead to a substantial increase in PV and high-intensity running performance in the majority of players7; however, the potential benefits of an additional hypoxic stimuli during sleep and some training sessions on Hbmass and in turn, total blood volume, was difficult to predict. Nineteen professional AF players participated in this study, which was approved by the University of Technology, Sydney (UTS) Human Research Ethics Committee. All players provided written informed consent. The final sample of players from which the data were drawn for analysis is detailed in the results section. Prior to inclusion into the study, players were examined carefully by a sports physician and were deemed to be free from illness/injury. All players lived at low altitude and were not acclimatised prior to the study. To ensure adequate iron stores for accelerated erythropoiesis, all players (except for two whose serum ferritin levels exceeded normal range) were prescribed with a daily iron supplement (Ferrograd C: containing 325 mg dried ferrous sulphate, 562.4 mg sodium ascorbate, Abbott Australia, Botany Bay, Australia) for 2 weeks prior to and throughout the duration of the 2-week camp. A parallel two groups, randomised matched, longitudinal (pretest, midtest, post-test) design was used. Players between each group were matched according to their performance (Yo-Yo Intermittent Recovery test level 2 (Yo-YoIR2)), playing experience and playing position prior to allocation. The study was conducted immediately following the off-season period (4 weeks after the end of the previous competitive season) and consisted of an experimental 2-week training camp (Qatar—October 2011, usual off-season training plus heat (all players) and hypoxic (some players) exposure) followed by another 1-week training camp (Abu Dhabi—November 2011, unloaded training at sea level under temperate environmental conditions for all players) and then 2 weeks of unsupervised training (Melbourne, normal environmental conditions; figure 1). The temperature in Melbourne the week before the camp averaged 15°C (http://www.wunderground.com/history/airport/YMML/2011/10/17/WeeklyHistory.html). During the initial 2-week training camp (Qatar), all players participated in outdoor AF-specific skills and indoor strength sessions (figure 1). In addition, they slept (12 nights) and cycled indoors (‘interval cycling’ sessions: (10–15 maximal effort repetitions of 15–30 s)×3–5 sets14) in either normoxic air (NORM, n=9) or normobaric hypoxia (FiO2, 15.2–14.3%, corresponding to a simulated altitude of 2500–3000 m, HYP, n=10). The second phase of the camp (Abu Dhabi) included only skills and strength sessions, and all players slept in normoxia. The unsupervised training period (Melbourne) was composed of two resistance and three high-intensity running (10 reps of 100–300 m runs at 70–80% of maximal sprinting speed) sessions each week. Players could drink ad libitum during all training sessions, and were provided with a post-training nutrition plan developed by a nutritionist to ensure adequate fluid and nutrient intake between the sessions. Study overview. Experimental schedule, training load and contents during the experimental camp (Camp) and the following weeks in players in the hypoxic (HYP) and normoxic (NORM) groups. T: travel. (1)Except for walking and skill sessions, which were performed in the heat for both groups (32±1°C), all training contents were performed under temperate environmental conditions (22±1°C). (2)Except for the cycling sessions, which were performed in normobaric hypoxia for the HYP group (equivalent to 2800 m), all training contents were performed in normoxia. In addition, players in HYP slept and had their social time in hypoxia (equivalent to 2500–3000 m). Haemoglobin mass (Hbmass) and blood volume (BV) were measured in Australia (AU) before and after the trip, and in Qatar (QA) at the start and end of the Camp with similar methods and materials (see methods). Blood: refers to haematological measures such as haematocrit levels and iron status. Yo-Yo IR2: Yo-Yo Intermittent recovery test level 2; CMJ: counter movement jump, 5 min: submaximal running test. There was no clear difference in training load between the two groups (see Results section). Players were exposed to heat when walking from/to the training facilities (∼15 min), during all skill sessions and outdoor recreation time. Exposure time was carefully recorded (±1 min), and temperature and relative humidity (RH) were measured at the start of each training session with a Kestrel 4500 Pocket Weather Tracker (Nielsen-Kellerman, Boothwyn, Pennsylvania, USA). Skills sessions were performed on a natural grass training pitch (ie, 120×150 m). The training, sleeping and recreational hypoxic facilities were normobaric rooms with O2 filtration (CAT system, Colorado Altitude Training, Louisville, Colorado, USA). Three days prior to the study start, all hypoxic rooms were calibrated by qualified engineers. During the Qatar camp, players were blinded towards the environmental condition to which they were exposed (both for sleeping and training times). However, they were informed about the treatment they received after the last testing session at the Qatar camp based on the coaches’ decision for motivational purposes. During sleeping/day times, players in the HYP group were exposed to a normobaric hypoxia equivalent to 2500 m (FiO2 15.2%) for the first 2 days/nights of the intervention period. Thereafter, the O2 fraction was decreased to the equivalent of 2800 m (FiO2 14.6%, 2 nights) and 3000 m (FiO2 14.3%, rest of the camp). Participants were confined to their rooms from 16:00 to 19:00, 20:00 to 06:00 and 08:00 to 10:00 during these 2 weeks. However, they were encouraged to spend more time in their rooms if desired (but this was not recorded). During all cycling sessions, the HYP group was exposed to normobaric hypoxia equivalent to 2800 m. Owing to logistic constrains, SaO2 was not measured. The Yo-YoIR2 test23 was used to assess high-intensity intermittent running performance. All players were familiar with this test, as it was part of the regular fitness testing battery implemented by the club. Briefly, the Yo-YoIR2 consists of repeating 20 m shuttle runs at increasing speeds (starting at 13 km/h) with 10 s of active recovery (consisting of 5 m of jogging) between runs until exhaustion. The highest HR reached during Yo-YoIR2 (5 s average) at Pre was retained as maximal HR (HRmax). Pre and Post heat-response tests were performed at the same time-of-day.8 Players rested in a seated position for 30 min before the test (laboratory temperature ∼21°C) during which time they were instrumented. Thereafter, they entered the climate chamber (44°C, 44% RH; Tescor, Warminster, Pennsylvania, USA) to perform 24 min of walking at 5 km/h (1.39 m/s, 1% grade) on a treadmill (Cosmed T170, Rome, Italy), followed by 24 min of seated rest. No fluids were consumed during the test. HR was also continuously recorded (Polar Team2 1.4.1, Polar Electro Oy, Kempele, Finland). Sweat loss was calculated as the difference in pretest and post-test body mass as measured using a calibrated electronic scale (weighed in underwear, body dried; Seca, Germany). Sweat samples were collected for the duration of the test through an absorbent pad with protective dressing (Tegaderm+Pad, 3M Health Care, Borken, Germany) positioned on the back (at the level of the right shoulder) of the participant. The skin was cleaned with deionised water prior to application of the pad. Samples were analysed for sodium concentration ([Na+]sweat; Dimension Xp and Plus, Siemens, Munich, Germany). Countermovement jumps (CMJ) were used to estimate explosive strength. The players had been familiarised with this test prior to the study. Prior to testing the players performed a standardised dynamic warm up followed by three submaximal practice jumps. The players then performed three maximal CMJs, with a 2 min rest between each. All CMJ's were performed with hands held firmly on the hips and participants were instructed to jump as high as possible. The jumps were performed with a self-selected countermovement depth and the jump with the highest score was used for further analysis. All CMJ's were performed on a commercially available force plate (400 Series Performance Plate—Fitness Technology, Adelaide, Australia) connected to a computer running software (Ballistic Measurement System—Fitness Technology, Adelaide, Australia) that recorded vertical ground reaction forces at a rate of 200 Hz. Jump height (cm) was calculated using custom-designed software (Mathworks, Natick, Massachusetts, USA). Transferrin and ferritin were measured prior to the camp using the Siemens Advia System (Siemens Ltd, Bayswater, Australia) in a commercial ISO accredited pathology laboratory (Healthscope Ltd, Clayton, Victoria, Australia). Serum iron levels were determined using ferrozine complex spectrophotometry (Siemens Advia 2400, Siemens Ltd, Erlangen, Germany). Ferritin levels were determined using chemiluminescent immunoassay (Siemens Advia Centaur XP, Siemens Ltd, Erlangen, Germany). Other haematological variables were collected using the same technique and similar equipment in Australia and Qatar. However, to ensure accurate comparisons, data were only compared from within the same laboratory (ie, Australia versus Australia and Qatar versus Qatar). Both measures were considered as baseline values, and data postcamp (Qatar) and 4 weeks later (Australia) were therefore expressed as relative changes from their original baseline. Hbmass was assessed using the optimised carbon monoxide (CO) rebreathing procedure first described by Schmidt and Prommer.26 This comprised inspiration of a bolus of 99.5% pure CO (BOC Gases, Sydney, Australia) in a dose of 1 mL/kg of body mass that was rebreathed for 2 min. A CO sensor (Draeger PAC7000, Draeger, Luebeck, Germany) was held in proximity to the mouth throughout the test to check for leaks. Fingertip capillary blood samples (200 μL) were analysed in triplicate for per cent carboxyhaemoglobin (%HbCO) using a spectrophotometer (ABL80 Hemoximeter, Radiometer, Denmark) before as well as 7 min after starting rebreathing. The CO rebreathing procedure provides an accurate and reliable method of measuring Hbmass with a low typical error of ∼2% in our laboratory (ie, 1.7% (90% CI 1.2% to 3.2%). From the Hbmass we calculated BV, red blood cell volume (RCV) and PV according to the following formulas. Haemoglobin concentration (Hb) and haematocrit (Hct) were determined from venous blood samples (Sysmex Corp, Kobe, Japan). Data are presented as means (±SD) and correlations as means (90% confidence limits, CL). All data were log-transformed for analysis to reduce bias arising from non-uniformity error and then analysed for practical significance using magnitude-based inferences.27 We used this qualitative approach because traditional statistical approaches often do not indicate the magnitude of an effect, which is typically more relevant to athletic performance than any statistically significant effect. The chances that the changes in performance or physiological variables were greater for a group or a time point (ie, greater than the smallest worthwhile change, SWC (0.2 multiplied by the between-subject standard deviation, based on Cohen's d principle)), similar or smaller than the other group or another time point were calculated. Quantitative chances of greater or smaller changes in performance or physiological variable were assessed qualitatively as follows: >25–75%, possible; >75–95%, likely; >95–99%, very likely; >99%, almost certain. If the chance of having beneficial/better or detrimental/poorer performances were both >5%, the true difference was assessed as unclear. Since changes in high-intensity running performance might be influenced by baseline training status, changes in Yo-YoIR2 were systematically adjusted for baseline Yo-YoIR2 performance. In a separate analysis, changes in Yo-YoIR2 were also adjusted for changes in CMJ performance (which is likely important for high-intensity running performance including changes of direction). Pearson’s product–moment correlation analysis was also used to investigate the association between all variables. The following criteria were adopted to interpret the magnitude of the correlation (r) between the different measures: ≤0.1, trivial; 0.1–0.3, small; > 0.3–0.5, moderate; > 0.5–0.7, large; > 0.7–0.9, very large and >0.9–1.0, almost perfect. If the 90% CL overlapped positive and negative values, the magnitude were deemed unclear; otherwise that magnitude was deemed to be the observed magnitude.27 Finally, individual responses to the intervention were calculated from the square root of the variance in the differences in the change scores in the HYP and NORM groups.27 A positive value represents greater individual responses to the HYP treatment. A negative value indicates more within-subject variation in the NORM group than in the HYP group. Two players missed at least one training/testing session and were excluded from the final analysis. Therefore, 17 players (n=8 and 9 for NORM and HYP, respectively) were considered for analysis. There was no clear difference at baseline (ie, Pre) between the two groups for any anthropometric and performance measures (table 1). During the camp, players participated in 10 outdoor AF-specific skills (32±1°C (range 33−29°C), 39±5% RH (range 37−50%), total exposure time=11.5 h), 7 ‘interval cycling’ sessions (22±1°C, 58±2% RH, total=4.3 h) and 8 indoor strength (23±1°C, 57±2% RH, total=9.3 h) sessions. Additionally, all players received a total of 15 h of incidental heat exposure (7.5 h/week, walking from/to the training pitch and sightseeing). For HYP, total hypoxic exposure (sleep+cycling sessions) was 14±1 h/day. The unloaded training week included four skills (≈29°C, ≈55% RH) and seven strength (indoor) sessions for a total of 10.5 h for all players. During the unsupervised period all players reported that they completed each prescribed training session. As illustrated in figure 1, there was no clear difference in total training load between both groups during the experimental camp (9786±286 vs 9904±200 training units for HYP versus NORM, respectively, −1%, 90% CL (−3;1), ES=−0.45 90% CL (−1.25;0.35) and chances for greater/similar/lower values of 9/21/71) and the following week (3859±879 vs 4323±835 training units for HYP versus NORM, receptively, −11% (−27;8), ES=−0.49 (−1.30;0.31), 8/19/73). Both groups showed very large and almost certain improvement in Yo-YoIR2 at Mid (+25% (20;30), ES=+1.4, 100/0/0) and at Post (+44% (38;50), ES=+2.3, 100/0/0; figure 2), with unclear between-group differences in the changes (eg, Δ Pre vs Post: −1%(−9;9), 21/52/27 for HYP vs NORM, figure 3). At 4WPost however, there was a possible better maintenance of Yo-YoIR2 performance in HYP compared with NORM (+6%(−2;15), 67/31/2; figure 3). Individual responses for Yo-YoIR2 performance were ∼ +7% and −5% at Post and 4WPost, ∼1/6 of the mean change in both groups. Individual responses from Post to 4WPost were ∼+2%, approximately 1/3 of the mean change in the NORM group. Performance responses to the camp. 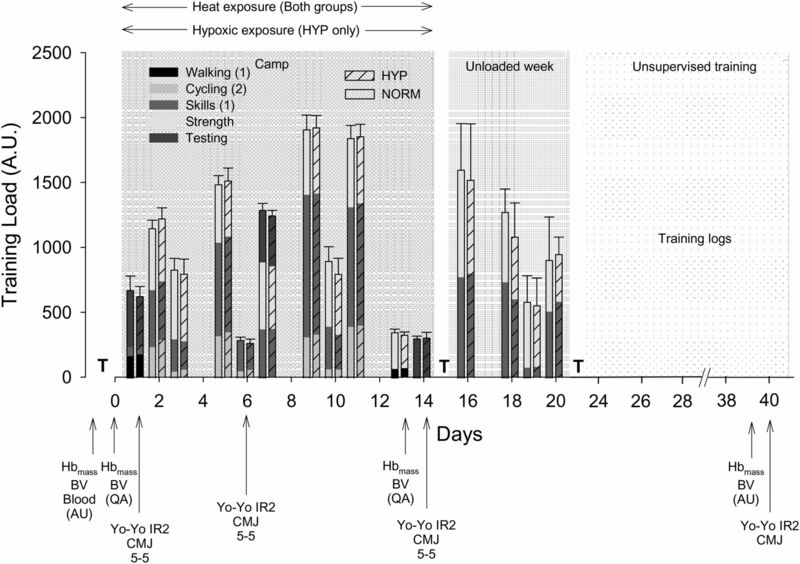 Mean (SD) values (upper panel) and individual relative changes (middle and lower panel) in Yo-YoIR2 during the camp and the following 4 weeks in players belonging to the normoxic (NORM) or hypoxic exposure (HYP) groups. ***, Almost certain within-group difference versus Pre (ie, day 0). †, Likely within-group difference versus Post (ie, day 13). #, Possible between-group difference in the change (4WPost vs Post). The grey horizontal area represents the typical error of measurement of the test (ie, 10%23). Comparison of the performance and physiological responses to both interventions. Differences in the changes in Yo-Yo distance (Yo-YoIR2), counter movement jump (CMJ), submaximal heart rate during the 5 min run in normoxic conditions (HRex), average heart rate, sweat loss and sweat sodium concentration ([Na+]sweat) during the heat response test, plasma volume (PV), haemoglobin mass (Hbmass) and blood volume (BV) for hypoxic (HYP) versus normoxic (NORM) group. The shaded area represents trivial differences in the changes (see Methods section). At Post, there was a possibly greater improvement in jumping height for HYP compared with NORM (+5%(−1;10), 83/13/3 for HYP vs NORM; figure 3). The between-group difference in the change in jumping height at 4WPost was unclear (+2%(−7;12), 54/22/24 for HYP vs NORM). Individual responses were 2% greater for the NORM group at Post, ∼1/2 the mean change in the NORM group. Individual responses from Post to 4WPost were ∼−5%, approximately twice the mean change in the NORM group. When changes in Yo-YoIR2 were adjusted for changes in CMJ, the main results were unchanged at Post (changes in HYP vs NORM, adjusted ES=−0.3(−0.9;0.4), unclear). At 4WPost, the maintenance of Yo-YoIR2 performance was more apparent when adjusted for changes in CMJ: changes in HYP versus NORM, adjusted change=+11% (1;21), adjusted ES=+0.5(0.1;1.0), 88/11/1 rated as likely (as compared with ‘possibly’ without adjustment, see above). HRex decreased almost certainly and very largely at Mid (ES=−5.5(−7.0;−3.9) and −1.90(−2.5;−1.4) for NORM and HYP, respectively), and further decreased almost certainly at Post (ES=−1.7(−2.6;−0.9) and −1.0(−1.5;−0.5) versus Mid for NORM and HYP, respectively). There was however no clear between-group difference in the changes, either at Mid or Post (figure 3). Individual responses for HRex were ∼−2% at Post, ∼1/4 the mean change in both the groups. Both groups showed a large decrease in average HR during the heat response test after the camp (109±6 vs 99±7 bpm for Pre versus Post, respectively; −10% (−12;−2), ES=−0.9, 100/0/0), with unclear between-group differences in the changes (eg, Δ Pre vs Post: +4.0% (−2.2;10.6), 75/15/10 for HYP vs NORM; figure 3). Individual responses were ∼5% greater for the NORM group at Post, ∼1/2 the mean change in HR in the NORM groups. Similarly, both groups showed a large decrease in [Na+]sweat Post (79.4±23.1 vs 57.9±20.2 mmol/L for Pre vs Post, respectively; −29% (−37;−19), ES=−1.0, 100/0/0), with unclear between-group differences in the changes (eg, Δ Pre vs Post: +18% (−12;58), 69/28/8 for HYP vs NORM; figure 3). Individual responses for [Na+]sweat were ∼28% greater for the NORM group at post, and corresponded to ∼2/3 of the mean change in [Na+]sweat in both groups. However, there was no clear Post difference in sweat loss compared with Pre (0.66±0.02 vs 0.69±0.02 L for Pre vs Post, respectively; −1.5% (−16;−15), ES=−0.0, 24/44/33), with unclear between-group differences in the changes (eg, Δ Pre vs Post: +5.3%(−23;43), 50/22/28 for HYP vs NORM; figure 3). Individual responses for sweat loss were ∼38% greater for the HYP group at Post, and corresponded to eight times that of the mean change in sweat loss in both groups. Both groups showed a likely (HYP, ES=+0.5 (−0.1;1.1), 79/17/4) and very likely (NORM, ES=+0.8 (0.3;1.2), 97/3/0) increase in PV at Post (figure 4), with unclear between-group difference in the change (figure 3). At 4WPost however, PV was very likely further increased in HYP (ES=+2.2 (0.4; 3.9) vs Pre, 96/2/2), while it tended to return to baseline in NORM (ES=+0.4 (−1.5; 2.4) vs Pre, 58/13/28; figure 4). The increase in PV in HYP was however not clearly greater than in NORM at 4WPost (+6% (−5;18); figure 3). Individual responses for PV were ∼1% and ∼10% greater for NORM than for HYP at Post and 4WPost, respectively, which corresponded to ∼¼ and ∼1.2 the mean change in the HYP group at the same time points. Hematological responses to the camp. Individual and average (SD) relative changes in plasma volume (PV), haemoglobin mass (Hbmass) and blood volume (BV) during the camp and the following 4 weeks in players belonging to the normoxic (NORM) or hypoxic exposure (HYP) groups. *, Likely within-group difference versus Pre (ie, day 0). **, Very likely within-group difference versus Pre (ie, day 0). ##, Likely between-group difference in the change. The dashed horizontal lines represent the typical error of measurement in our laboratory (ie, ∼2% for Hbmass and 5% for PV and BV). Note that the values were doubled checked for the outlier for PV-BV in the NORM group (30–25% increase), so that it was not removed. However, if this individual was removed, the differences between the groups would be greater, which suggest that the already substantial between-group differences are unlikely the consequence of this extreme value. Hbmass did not change in NORM (figure 4, all changes rated as unclear). Conversely in HYP, Hbmass was likely (ES=+0.3 (0.6;0.5), 77/23/0) and very likely (ES=+0.7 (0.3;1.1), 97/3/0) increased at Post and 4WPost, respectively (figure 4). Therefore, there was a likely greater increase in HYP than in NORM both at Post and 4WPost (eg, +4.6% (0.0;9.3) at 4WPost, 86/12/2; figure 3). Individual responses for Hbmass were ∼2.5% greater for the HYP group both at Post and 4WPost, ∼1/2 of the mean change in the HYP group at the same time points. Regarding BV, both groups showed a likely (HYP, ES=+0.5 (0.0;1.0), 88/11/1) and very likely (NORM, ES=+0.8(0.3;1.3), 97/3/0) increase at Post (figure 4), with unclear between-group difference in the change (figure 3). At 4WPost however, BV was very likely further increased in HYP (ES=+1.3 (0.5;2.1) vs Pre, 98/1/0), while it tended to return to baseline in NORM (ES=+0.3 (−0.9;1.6) vs Pre, 55/24/21; figure 4). There was a likely greater BV increase in HYP than in NORM at 4WPost (+5% (−3;14); figure 3). Individual responses for BV were ∼+3 and −7% at Post and 4WPost, ∼1/2 the mean change in the HYP group. There was no clear correlation between changes in Yo-YoIR2 performance and either PV, Hbmass or BV (figure 5). There was no clear relationship between changes in Hbmass and baseline measures. Associations between variables. Relationships between changes in Yo-Yo intermittent recovery level 2 (Yo-YoIR2) performance and changes in plasma volume (PV, upper panel), haemoglobin mass (Hbmass, middle panel) and blood volume (BV, lower panel) in players belonging to the normoxic (NORM) or hypoxic exposure (HYP) groups. There was also no clear correlation when considering within-group data. This study is the first to describe the performance and haematological adaptations to a combination of heat and hypoxic exposure in professional AF players in an applied training setting. Results showed that (1) large increases in BV and high-intensity intermittent running performance can be observed after 7 days of training (ie, Mid) involving only four skill-based training sessions in the heat, with additional hypoxic exposure providing no additive effect; (2) in this population, the addition of hypoxic exposure during sleep time and some training sessions for a total of 170 h was enough to stimulate erythropoiesis, as shown by moderate-to-large increases in Hbmass (and hence, BV) both immediately and 4 weeks following the camp. At the end of the camp, there was an early and likely 3% increase in Hbmass in the HYP group, while it did not change in the NORM group (difference in the changes=+3.2% (0.8;5.7) for HYP vs NORM). These differences in the changes were well above both the SWC27 and the typical error of measurement in our laboratories (<2%), within the range of usual random variations in athletes (ie, ≤3%29 ,30), and similar to changes observed recently in a similar population (but following a 19-day altitude training camp).12 To our knowledge, this study is the first to show the Hbmass responses to a combined heat+hypoxic training camp in elite team sport athletes and this is the first time that such a substantial increase in Hbmass is reported after such a short period of time, that is, after 170 h (12×14 h/night–day). Our present data also confirm that increases in Hbmass are unlikely linear and that prolonged hypoxic exposure might not be requisite to gain large increases in Hbmass.22 ,31–33 For instance, while it is generally recommended to spend at least 14–22 h/day for more than 3–4 weeks at altitude6 ,34 or to accumulate at least 300 h32), early erythropoiesis may occur within 14 days (with 1431 to 16 h33 of exposure per day) or 21 days (with 10 h of exposure per day22) of LHTL. Factors including athletes’ baseline training status, baseline Hbmass20 ,21 and the severity of simulated exposure22 might explain the present large erythropoietic responses observed and the possible dissimilarities with previous studies. In the current study, most players started the camp with a relatively poor training status compared with their usual fitness levels and had never previously been exposed to hypoxic environments for long periods. While ≈200 h of hypoxic exposure failed to improve Hbmass in elite Nordic skiers (likely hypoxia-acclimatised and already possessing high Hbmass values),35 a similar ‘hypoxic dose’ lead to a 8.5% increase in Hbmass in highly-trained, non-hypoxia-acclimatised, swimmers.18 In these lines, a very large and negative correlation has been shown between Hbmass response to hypoxic exposure and baseline Hbmass.21 The football players in the current study presented low baseline Hbmass values (11 g/kg) compared with elite endurance athletes (>14 g/kg), which lends support to this latter hypothesis. Importantly, in the present study, since there was no change in Hbmass in the NORM group at the end of the camp (despite similar training load than HYP; figure 4), a training-induced increase in Hbmass30 was unlikely. The observation that there was no clear additional performance benefits for the HYP group is an important finding of the present study, and is consistent with the concept that a minimal ‘hypoxic dose’ has to be prescribed to observe meaningful changes in physical performance (ie, generally more than 3−4 weeks34 or a total of ≈300 h32). We also suggest that in comparison with the heat acclimatisation-induced effects, the 3% increase in Hbmass in the HYP group was too small to substantially alter more both maximal oxygen uptake and high-intensity running performance.39 This conclusion is further reinforced by the blinding of the players toward the intervention (ie, for sleeping and cycle interval training), so that a placebo effect during the post-tests was unlikely in the HYP group.40 ,41 The mechanisms by which high-intensity running capacity was improved following the camp however remains unclear with present measures, since we did not observe any significant association between the changes in either PV, BV or Hbmass and Yo-YoIR2 performance (figure 5). It is therefore possible that other mechanisms (not measured here) may also explain the performance benefits of heat acclimatisation. While the present results are of great relevance for many team sport athletes since such hot environmental conditions can be found in most countries during the spring/summer periods, they also provide new information in that additional hypoxic exposure had no acute benefit on either submaximal HR response or high-intensity running performance within such a short period (ie, <2 weeks). Despite the likely beneficial physiological adaptations observed (ie, increased Hbmass), present results directly question the efficacy of using hypoxic exposure for obtaining short-term performance benefits in team sport athletes (eg, preparation for competition at sea level). The data detailed below however suggests that hypoxic exposure might augment chronic training effects. In parallel to these hematological changes 4WPost, there was a possible trend for a better maintenance of Yo-YoIR2 performance in the HYP compared with NORM group (figures 2 and 3). Despite large interindividual variations in changes in Yo-YoIR2 performance (figure 2, the SD for 4WPost-Post changes were 32% and 11% for NORM and HYP group, respectively), and the unsupervised training during the postcamps phase, these results are in accordance with empirical observations showing that enhanced physical performances generally occur 2−4 weeks following hypoxic exposure.6 While it could be intuitive that the observed changes in BV provided an ergogenic benefit17 and contributed to the better maintenance of Yo-YoIR2 performance in HYP compared with NORM group, there was no direct association between these variables (figure 5), suggesting that other mechanisms (not measured here) may also explain the delayed performance benefits of the hypoxic exposure.33 ,47 For example, the multifactorial cascade of responses induced by hypoxia including angiogenesis, glucose transport, glycolysis and pH regulation, may partially explain improved high-intensity endurance performance independent of a greater Hbmass.47 Specific beneficial non-hematological factors also include improved muscle efficiency probably at a mitochondrial level, greater muscle buffering and the ability to tolerate lactic acid production.33 ,47 Players in the HYP group also performed seven ‘interval cycling sessions’ in hypoxia during the camp. 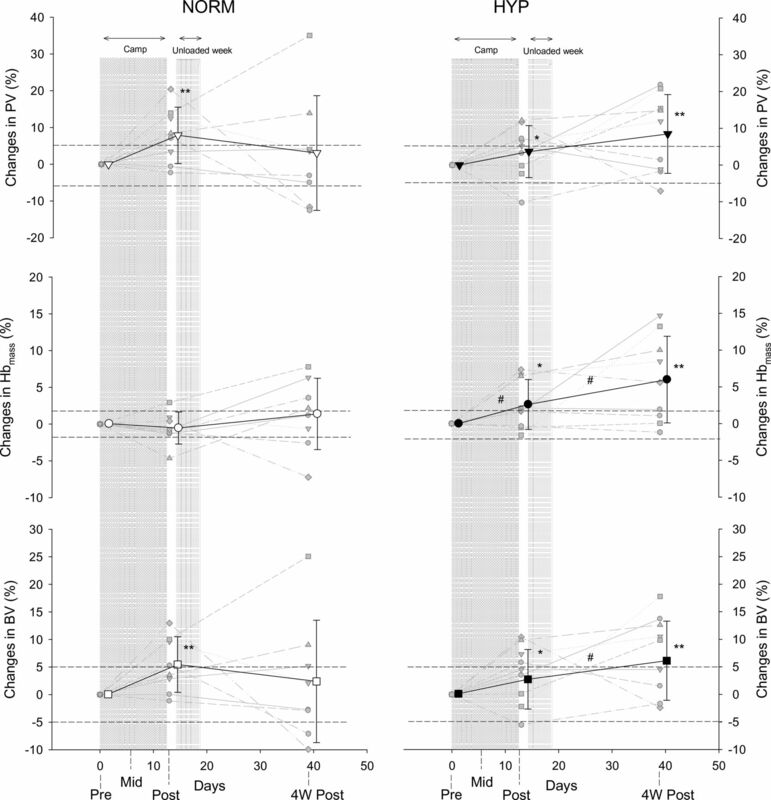 Despite inconsistencies, training ‘high’ has been suggested to trigger muscle adaptation to compensate for decreased O2 availability during exercise, which can have direct implications for high-intensity intermittent running performance.6 ,14 Additionally, despite the lack of a direct transfer of the hypoxic exposure into improved performance immediately following the camp, the training and environmental stimulus provided in HYP group may have facilitated the training adaptations. This may also explain the better maintenance of Yo-YoIR2 running performance observed 4 weeks after the camp. One of the primary limitations of the present study was our inability to both examine the independent heat effects, and document training loads during the unsupervised training period. However, all the physiological and performance changes after heat exposure were well above the smallest worthwhile change and the players in each group, as professional athletes, reported that they adhered to their individual programme. We also acknowledge the lack of a clear control of the effectiveness of the blinding.40 Another limitation is related to only having single Hbmass measures at each time point. While duplicate measures would have decreased the possible error of measurement, increasing the number of blood samples was unrealistic with the present population of elite professional players. In contrast, we consider that the elite standard of the players’ and the realistic training setting enhanced the ecological validity of the present investigation of elite players’ training practices. In summary, a very large increase in high-intensity running performance was observed after only 1 week of training in the heat in elite football players. An additional hypoxic exposure had no immediate performance benefits, despite an increased Hbmass. Moreover, 4 weeks later, hematological variables remained elevated and high-intensity running performance tended to be maintained only in the hypoxic group. Pending confirmatory research, present results suggest that a combination of heat and hypoxic training/exposure might offer a promising ‘conditioning cocktail’ in team sports exercising at sea level in temperate environments. More research is still needed to identify the factors affecting the individual responses and therefore optimise such interventions at the individual player level. Further investigations are also warranted in team sport players to demonstrate the optimal dosing and timing of such heat+hypoxic camps, and to examine how this may translate into competitive match outcomes. Hypoxic exposure (live-high, train-low model) can increase haemoglobin mass, especially in athletes with low baseline levels such as team sport players. Short-term heat acclimatisation can increase plasma volume in team sport players. Combined, increased haemoglobin mass and plasma volume improve total blood volume and convective O2 delivery, which can, under some circumstances, improve high-intensity exercise performance. Preseason outdoor football training in hot ambient conditions induces (at least) partial heat acclimatisation in professional Australian Rules Football players, and is associated with very large improvements in high-intensity running performance. The substantial increases in haemoglobin mass and blood volume observed immediately after a ‘live high-train low in the heat’ camp can last at least 1 month. Compared with training in the heat only, an additional hypoxic stimulus during sleep and some training sessions has no high-intensity running performance benefits immediately after the camp. The possible greater delayed effects of the hypoxic exposure, if any, are only small in magnitude. The authors thank all staff from Aspire Academy and Aspetar for their support during the camp, especially Mohamed Ibrahim Elzain Elgingo and Eric Kimathi.
. Match analysis and the physiological demands of Australian football. Sports Med 2010;4:347–60.
. Physiology of small-sided games training in football: a systematic review. Sports Med 2011;3:199–220.
. Preparation for football competition at moderate to high altitude. Scand J Med Sci Sports 2008:85–95.
. Current knowledge on playing football in hot environments. Scand J Med Sci Sports 2010:161–7.
. ‘Living high-training low’: effect of moderate-altitude acclimatization with low-altitude training on performance. J Appl Physiol 1997;1:102–12.
. Combining hypoxic methods for peak performance. Sports Med 2010;1:1–25.
. Physiological and performance adaptations to an in-season soccer camp in the heat: associations with heart rate and heart rate variability. Scand J Med Sci Sports 2011;6:e477–85.
. Individual responses to short-term heat acclimatization as predictors of football performance in hot dry environment. Br J Sports Med 2012;46:810–5.
. The effect of 8 days of training in tropical environment on performance in neutral climate in swimmers. Int J Sports Med 2007;1:48–52.
. A heat acclimation protocol for team sports. Br J Sports Med 2008;5:327–33.
. Heat acclimation improves exercise performance. J Appl Physiol 2010;4:1140–7.
. Physiological and performance responses to a pre-season altitude training camp in elite team sport athletes. Int J Sports Physiol Perform 2012;8:391–9.
. Application of altitude/hypoxic training by elite athletes. Med Sci Sports Exerc 2007;9:1610–24.
. Significant molecular and systemic adaptations after repeated sprint training in hypoxia. PLoS ONE 2013;2:e56522.
. Assessment of group acclimatization to heat and humidity. J Physiol 1951;3:296–312.
. Acclimatization in a hot, humid environment: body fluid adjustments. J Appl Physiol 1976;5:786–96.
. Haemoglobin, blood volume, cardiac function, and aerobic power. Can J Appl Physiol 1999;1:54–65.
. Living high-training low: effect on erythropoiesis and aerobic performance in highly-trained swimmers. Eur J Appl Physiol 2006;4:423–33.
. Enhancing team-sport athlete performance: is altitude training relevant? Sports Med 2012;9:751–67.
. Does ‘altitude training’ increase exercise performance in elite athletes? Br J Sports Med 2012;11:792–5.
. Is live high-train low altitude training relevant for elite athletes with already high total hemoglobin mass? Scand J Med Sci Sports 2012;3:303–5.
. Ten hours nightly simulated altitude at 3000 m increases hemoglobin mass and VO2max. Int J Sports Physiol Perform 2012;8:36672.
. The Yo-Yo intermittent recovery test: a useful tool for evaluation of physical performance in intermittent sports. Sports Med 2008;1: 37–51.
. Determinants of the variability of heart rate measures during a competitive period in young soccer players. Eur J Appl Physiol 2010:869–78.
. Use of RPE-based training load in soccer. Med Sci Sports Exerc 2004;6:1042–7.
. The optimised CO-rebreathing method: a new tool to determine total haemoglobin mass routinely. Eur J Appl Physiol 2005;5–6:486–95.
. Progressive statistics for studies in sports medicine and exercise science. Med Sci Sports Exerc 2009;1:3–13.
. Effects of heat acclimation of distance runners in a moderately hot environment. Eur J Appl Physiol Occup Physiol 1980;2–3:189–98.
. Total hemoglobin mass—a new parameter to detect blood doping? Med Sci Sports Exerc 2008;12:2112–18.
. Seasonal variation of haemoglobin mass in internationally competitive female road cyclists. Eur J Appl Physiol 2010;2:221–31.
. Time course of haemoglobin mass during 21 days live high:train low simulated altitude. Eur J Appl Physiol 2009;3:399–406.
. Time course of the hemoglobin mass response to natural altitude training in elite endurance cyclists. Scand J Med Sci Sports 2012;1:95–103.
. The contribution of haemoglobin mass to increases in cycling performance induced by simulated LHTL. Eur J Appl Physiol 2011;6:1089–101.
. Effect of hypoxic ‘dose’ on physiological responses and sea-level performance. Med Sci Sports Exerc 2007;9:1590–9.
. Living high-training low: effect on erythropoiesis and maximal aerobic performance in elite Nordic skiers. Eur J Appl Physiol 2006;6:695–705.
. Jet lag and travel fatigue: a comprehensive management plan for sport medicine physicians and high-performance support teams. Clin J Sport Med 2012;22:268–73.
. Supramaximal training and post-exercise parasympathetic reactivation in adolescents. Med Sci Sports Exerc 2008;2:362–71.
. Strength and endurance of elite soccer players. Med Sci Sports Exerc 1998;3:462–7.
. The role of haemoglobin mass on VO(2)max following normobaric ‘live high-train low’ in endurance-trained athletes. Br J Sports Med 2012;11:822–7.
. ‘Live high-train low’ using normobaric hypoxia: a double-blinded, placebo-controlled study. J Appl Physiol 2012;1:106–17.
. An attempt to quantify the placebo effect from a three-week simulated altitude training camp in elite race walkers. Int J Sports Physiol Perform 2010;4:521–34.
. Altitude and endurance training. J Sports Sci 2004;10:928–44. ; discussion 45.
. Reproducibility of performance changes to simulated live high/train low altitude. Med Sci Sports Exerc 2010;2:394–401.
. Eighteen days of ‘living high, training low’ stimulate erythropoiesis and enhance aerobic performance in elite middle-distance runners. J Appl Physiol 2006;1:203–11.
. Search for genetic determinants of individual variability of the erythropoietin response to high altitude. Blood Cells Mol Dis 2003;2:175–82.
. Induction and decay of short-term heat acclimation in moderately and highly trained athletes. Sports Med 2011;9:757–71.
. Nonhematological mechanisms of improved sea-level performance after hypoxic exposure. Med Sci Sports Exerc 2007;9:1600–9.
. Effect of training intensity distribution on aerobic fitness variables in elite soccer players: a case study. J Strength Cond Res 2011;1:66–71.